Like visual artist Steve McQueen, who also recently made the shift from museums and galleries to the cinema with a story involving British imperialism and the body politic made literal, Iranian-born Shirin Neshat certainly knows how to speak without words. Winner of the Silver Lion at last year’s Venice Film Festival, Neshat’s debut feature, Women Without Men, is based on a novel with magical-realist flourishes by author Shahrnush Parsipur (who also has a delightful turn as a brothel madam in the movie), and like its source, the film’s images are painstakingly crafted and painfully alive. Which makes this film about the death of a democracy, and which opens with a suicide, all the more compelling. Indeed, one only wonders what heights Neshat would have reached had she chosen to do what McQueen did with Hunger and worked with a writer and actors up to her visual level. The script, co-written by Neshat and her frequent collaborator Shoja Azari, follows four women in the days leading up to the 1953 C.I.A.-backed coup d’etat that overturned democracy and returned Iran’s Shah to power. Fakhri (Arita Shahrzad) is the eldest, married to a military man loyal to the Shah, who leaves her marriage after a rebel artist/former lover returns from America. Munis (Shabnam Tolouei) is a wannabe political activist who longs to be free of her domineering brother as much as her friend Faezeh (Pegah Ferydoni) longs to marry him. Then there’s Zarin (played by Hungarian actress Orsi Toth), a prostitute who loses the ability to see the faces of men. While the acting is overwrought at times, and the scenes are often less than nuanced (with a predictable shot of artists discussing politics in a left-wing restaurant and a clichéd close-up of Zarin looking bored and distant as she’s getting screwed), the camerawork is always breathtakingly smooth and precise. The same can be said of the visceral sound design, which goes from shouts of street protestors to barely audible prayers in the blink of an eye. Certain standalone moments—like Zarin scrubbing her skin raw in a women’s bathhouse or a male singer’s impromptu serenade of officers who’ve just stormed a party at Fakhri’s mystical orchard—are both heartbreaking and thrilling (and belie the film’s roots in Neshat’s series of video installations based on the characters). 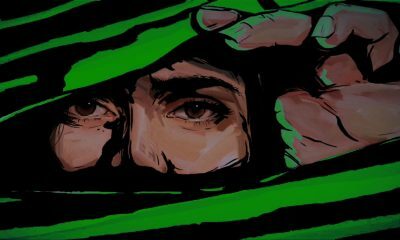 Perhaps most intriguing is the evocatively colored, haunted garden where the women’s lives converge—a distant, Middle-Eastern cousin to Lars von Trier’s woods in Antichrist. “The orchard was turning, breaking under this great weight,” we hear in voiceover as the political turmoil begins to affect quite literally the very nature of Iran—then “under this turbulence there was almost silence underneath.” Which brings us back to that opening suicide with a rooftop jumper’s longing for silence. 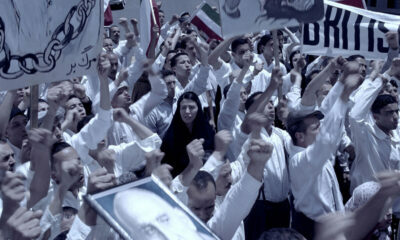 Neshat’s camera slowly pulls away, from behind the woman’s head, as life simply retreats. There is no dramatic leap to death, but rather only a tentative embrace of “a new form, a new way,” much like Iran’s short-lived experiment in democracy. In other words, to mourn the loss of personal life and the political loss of country is at its heart the very same thing.